Last time around, which by the way, wasn’t too long ago, besides a restaurant, I wrote about two area attractions that don’t generally get a lot of publicity, the Basilica, and the Maryland Historical Society. I received a few comments from readers thankful for the information. With that in mind, here, besides a restaurant, are two more area attractions that could use some exposure. I’ll begin with the Mother Seton House & Historic Seminary Chapel, 600 North Paca Street. 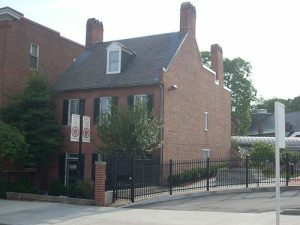 For some basic facts, it is the home of the country’s first Roman Catholic Seminary (1791), the home of Mother Seton, the first U.S. born Saint (1808-’09) and the first Neo-Gothic church in America by Godefroy. It also served as a gathering place for people of color. Maximilian Godefroy designed the chapel in 1808. It is quite the place for a visit for reflection. In the basement of the chapel is the Chapelle Basse, where back in the first half of the 19th century a community of Haitians worshipped. Mother Seton lived in the house that bears her name. She operated an academy for girls during the years 1808-1809. The house is empty now, and as the brochure states, ‘remains a time capsule of the early 1800s’. Groups of all ages are welcome. The hours are noon to 3:30 p.m. Monday-Friday and 1 p.m. to 3 p.m. Saturday and Sunday. Admission and parking are free. If you’re planning a group tour be sure to make a reservation, 410-728-6464. For more information go to www.stmaryspacast.org. Let’s take a drive to Towson, 535 Hampton lane, and visit the Hampton National Historic Site. This museum covers hundreds of years of American History. 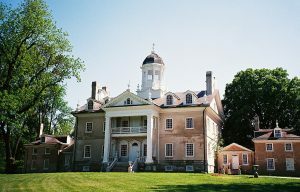 The main building is an 18th century Georgia Mansion. Some other sites on the 62.5-acre property include the Lower Farm, the Orangery, park grounds, and formal gardens. This Historic site is part of the National Park Service. Actually, there are more buildings than I outlined. The actual count is about 20 with about 40,000 artifacts. Their brochure states this could have been the largest private home in the country around 1790. The tour highlights the history of the Ridgely family. It also tells the story of the enslaved African American, the European indentured servants, and the paid laborers. The main gates and parking lots are open 7 days a week from 8:30 to 5. Tours and the Visitor Center are available Thursday thru Sunday from 9 to 4 and the other buildings are accessible Thursday thru Sunday 8:30 to 3:30. Tours are free and last about 45 minutes to an hour. Reach them at 410-823-1309 or go to www.nps.gov/hamp. OK, I’m a bit hungry so let’s eat. For that we have to go to the city, but not downtown. We’re going to the Broadview Apartments in Roland Park, 105 West 39th Street and drop by Cypriana for dinner. You could go there for lunch, but since they’re only open for dinner it wouldn’t make much sense. This was my first visit. I went there on the recommendation of a friend. Glad I did. 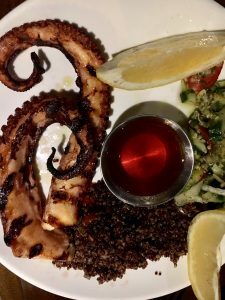 I had an outstanding grilled oyster Dish ($18.00) It was grilled and garnished with tabouli and red quinoa. My dinner companion, a far better judge of food than me, devoured the lamb rib chops (market price). These were three chops blended with herbs and grilled over coals. 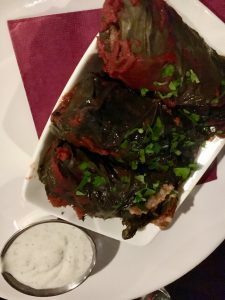 A few other signature dishes include the grilled salmon, falafels, stuffed grape leaves, and sheftalies. Sheftalies? What’s that? 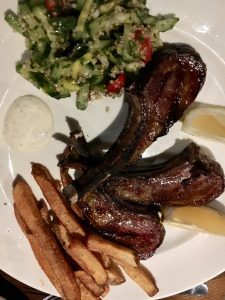 It is a dish I was told by chef/co-owner Maria Kaimakis that you just can’t get anywhere else. It’s a Cyprus specialty. Here comes the description as shown on the menu – traditional hand-rolled pork crepinette made with Yiayia Androulla’s family recipe. It’s served in a handmade pita with tomato cucumber relish, yogurt dill sauce, and tahini. Coincidentally I made it at my house the night before! The restaurant seats about 180 including an outdoor patio that also contains a garden. This garden provides veggies in season. The atmosphere is casual, but definitely a bit upscale. Except for about three items, the menu is gluten-free. Most of the food, as you would expect from a restaurant-heavy in Greek and Mediterranean dishes, is imported. There’s a wide choice of wines, cocktail, and beer. You can enjoy them, along with your food at the bar. Cypriana opened in February 2017. And parking is not a problem. A free lot awaits directly across the street. Maria’s husband, Vassos, certainly deserves a mention. Reservations are a very good idea. Reach them at 410-837-7482 or at cypriana.com. Closed Monday.